We've certainly observed -- and closely -- the shenanigans of Stacy C. Eggers IV ("Four") and his minions on the Watauga County Board of Elections -- his poor brother Luke, putative chair of the BOE, and Bill Aceto, putative secretary -- and we know that Aceto bragged to a Democratic office-holder in August of 2013 that they were "going to take the gloves off" -- particularly with reference to "fixing" the ASU student vote so that it wouldn't plague Republican hopes in Watauga County any longer. They did their best (worst), even though their scheme to turn Boone 1, 2 & 3 precincts into one voting "mega-precinct" was rejected at the state level. They succeeded in getting Early Voting off the ASU campus, and now they've moved one majority urban precinct (New River 3) to the Far Side of the Moon and put it into a mega-church engaged in well known partisan Republican activities (and possibly staffed now by a Democratic Demon Swat Team and Exorcism Unit to pray the devil out of any left-leaning voters who venture out there to cast a ballot). But the worst damage that's been done (lately) to ballot access is that provision in the 2013 voter law passed by the NC General Assembly which disallows provisional ballots cast "out of precinct." People move frequently in this culture, especially young people, and they forget to update their voter information. So they go to their new precinct polling place on election day, only they're not on the rolls for that precinct, so they request a provisional ballot, because they ARE properly registered in the county, but the Republicans' new law sez "NO, you LOSE!" College students are disproportionately singled out for that treatment. 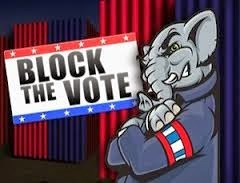 Bob Hall, executive director of the voter rights org DemocracyNC, has done research on hundreds of the provisional ballots that were thrown out in the May primary, and he has found evidence that 454 of those ballots would have been counted under election rules prior to the Big Republican Re-Write. While black voters make up just 22 percent of the state’s electorate, they accounted for 39 percent of the rejected ballots. Fifty-seven percent of the ballots were cast by registered Democrats, who make up only 42 percent of North Carolina voters. “It proves, really, what has been said about the discriminatory nature of the new law,” Hall said, noting that the people affected include a veteran, students and even a precinct judge. We have to defeat these bastards (to use the scientifically precise term for them).